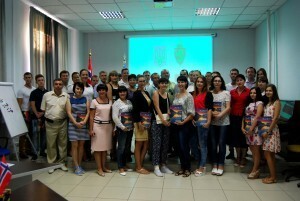 On 7 September 2016 at Petro Mohyla Black Sea National University, a solemn opening of the latest courses on professional development and social adaptation of military men and their families was held. 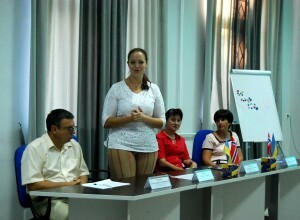 Education is performed in terms of the project “Ukraine – Norway” and the National Fund of Social Adaptation is its organizer. From 12 September 2016 to 20 December 2016, first year students will study the subject “Practical Web Design: engineering, creation and monitoring of web-sites.” Lessons will be held in the evening at Petro Mohyla National University. As a result, this will encourage effective training of all course participants’, but will not affect their professional activity. Working on the development and monitoring of web-sites for public utilities in Mykolaiv will help this and another group of participants get work later, after finishing this course. 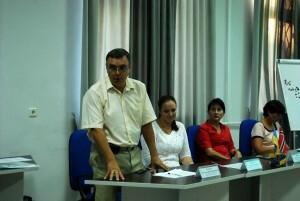 If graduates make all the tasks during the course, at the end they will get three documents: Certificate of Professional Development on the part of Petro Mohyla Black Sea National University, General Certificate of Nord University and Perto Mohyla Black Sea National University and also General Certificate of the Ministry of International Affairs and the Ministry of Defense of Norway. Project “Ukraine – Norway” consists of several parts and is supported in Ukraine by International Fund of Social Adaptation, Ministry of International Affairs of Norway and International Alliance of Universities, among which Nord University and twelve Ukrainian high educational establishments are. The supervisor of the project “Ukraine –Norway” on the behalf of International Fund of Social Adaptation in Mykolaiv is a charity organization “Conversion of military personnel”. One part of the course participants’ professional training is conducted by Perto Mohyla Black Sea National University, and the other part is held by the abovementioned charity organization. The present-day problem of social and psychological adaptation, and psychological adaptation of the military men, who are transferred to the reserve, and military men’s families, exists because of absence of psychological training to the change of the life conditions. Professional development, psychological rehabilitation and social adaptation help to overcome all the negative effects of military service, to renew psychological balance, form main aims in life, to encourage individual development and also to advance self-motivation for active social adaptation in society. For 12 months after the end of education process, in terms of this project, the charity organization controls all questions connected with employment and legal support of the project’s participants. Let’s congratulate all first year students, who have taken part in this project, with the start of their professional development. We wish them inspiration and successful training. For more detailed information on military men’s collaboration and training, please, contact us: Mykolaiv City, 68 Desantnykiv St., 10, room 5-103, tel. (0512) 76 55 59.